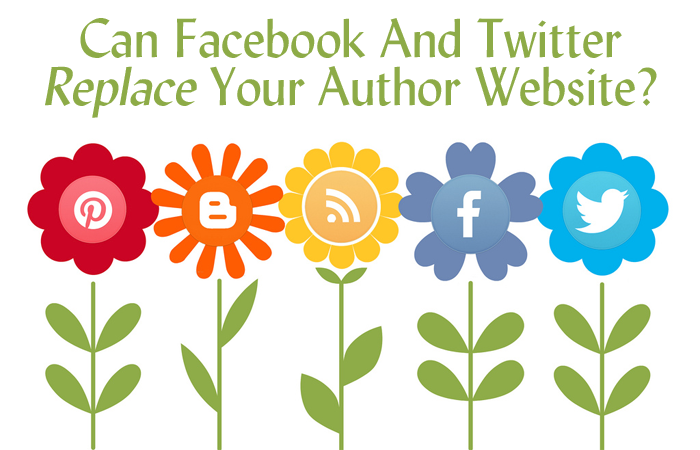 Can Facebook And Twitter Replace Your Author Website? As social media becomes increasingly prominent in our lives, some authors may decide to use Facebook or Twitter as their sole means of marketing. But is this shift in strategy beneficial or detrimental to creating an author brand? While Facebook and Twitter are excellent complements to your author platform, an author website will provide superior marketing capabilities. Showcasing excerpts or published works. You really shouldn’t be posting paragraphs and paragraphs of text on Facebook, and we all know that the occasionally nerve-racking pressure of tweeting in no more than 140 characters can be daunting as well as restricting. On your author website, you can post excerpts from your novel, published poems, and short prose. You can also link out to literary journals that have published your work online, and you can make a bigger impact by creating a single author bio with all of your credits in one place. Displaying strong visuals. While you can post a photo to Facebook or Twitter, the visual impact isn’t as stunning as having an impressive author website for your fans to visit. Your website design can showcase your personality and wow your fans if your images have been chosen carefully. Talking about you as a writer. A Web address on your query letter is an invitation for an agent to visit your author website and learn more about you. It’s your digital business card. Likewise, having an author website is a great place for readers and potential fans to get a cohesive look at you as a writer, as opposed to a more jumbled look at who you are on social media. Who wouldn’t want to learn a little more about an author they respect? Often people will find an author’s website before they find his or her Facebook Page. Your author website is ultimately the first, most complete source of your information. Social media comes second. Selling books and other merchandise. While you can certainly link to a retailer that sells your book on Facebook or Twitter, an author website can offer its own shopping cart where fans can purchase or even preorder your latest release. And, while they’re at it, visitors can sign up for your author mailing list to receive updates on your future writing endeavors. Providing a hub that links out to your Facebook and Twitter. Let your social media outlets and your website work in conjunction. Just as you can tweet about your author website and post a link to it on Facebook, you can also incorporate your social media platforms on your website. Exuding professionalism. An author website suggests professionalism: You’re ready and willing to go that extra mile to market your brand and your craft. Anyone can have a Facebook profile or Twitter account, but a website says “I’m serious and committed.” And that’s what agents and editors are looking for. So before you go selling your domain name and taking down your website (or trashing the idea of building one at all), consider all of the advantages of an author website. Think of your author website as the home for your author brand and your social media outlets as the various rooms inside. While each room is important and useful in its own respect, they are, and should be, part of a larger floor plan. QUESTION: How do you incorporate social media into your author website? ← Web Design Relief Links Roundup, January 2014, Part 2! 10 Responses to Can Facebook And Twitter Replace Your Author Website? First of all, I would like to say this article is a great way to show others they shouldn’t abandon the thought of an author website. Secondly, I have a badge on my website which will take readers to my Facebook page if they wish. I also have Twitter, Google+ and Pinterest buttons so readers can share my website with others. My personal experience is to also integrate a blog (my website host has that as an included page); this way you can update your blog and link to other pages within the site (ie: book page). I have the freedom to add as many pages as I like, and the platform I use makes it simple and easy to do. The best part about an author website is its content will (or should) keep readers interested for more than the few seconds they skim something on social media. I see very little point in an author website if you are already on Twitter/Facebook, Goodreads/ Reddit etc etc. Unbless it is linked to a blog. If people want to buy your books, they will find you via the aforementioned platforms. Hello! In order to subscribe to our RSS, you’re going to need a program or extension for your browser that can read RSS. This is a link to instructions for Firefox. And this is a link to instructions for Chrome. If you’d rather insert the URL manually, you can use this link. We’re always glad to help fellow writers! Thanks for finally talking about >Can Facebook And Twitter Replace Your Author Website? – Web Design Relief <Liked it!